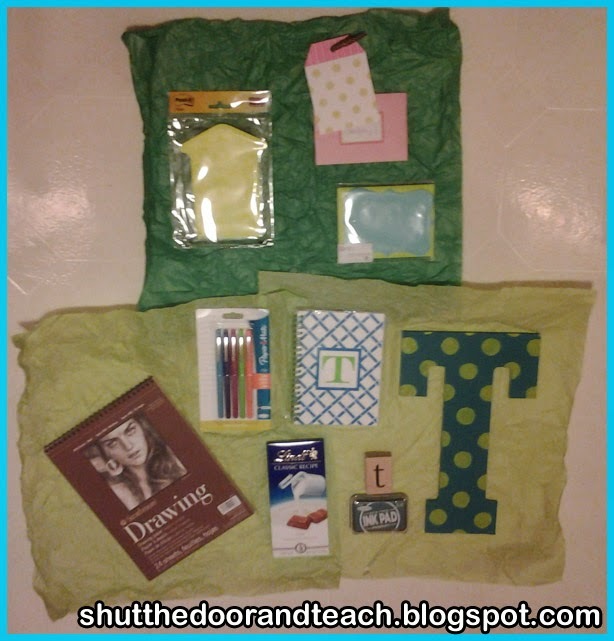 Shut the Door and Teach: My May Slant Box Has Arrived! I have never participated in the SLANT box exchange before, although I've checked in with Jameson's blog regularly to see what the themes were. I knew one day a theme would call out to me, and this May was the one! Our mission was to learn what we could about our partner and then include a monogrammed item in their package. 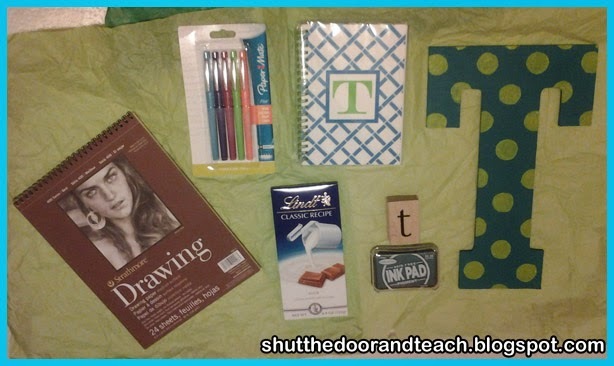 Who could pass on personalized teacher loot? The other general rules were the same in terms of the spending limit and including at least one hand made item. The sign up process was pretty easy (although the waiting is hard, haha). I was paired with two other bloggers who are coincidentally both first grade teachers. I was assigned to send a box to Andrea over at Teaching Little Smarties, and Stacey over at Monkeying Around in First was assigned to send a box to me. I will write more about Andrea in another post because the the time of writing, I don't know if she has received her box yet and I don't want to ruin her surprise. So for now, I wanted to share my experience with Stacey. Once the Google form was complete with our partners' contact information I went over to her blog to get to know her better. I am SO JEALOUS; her blog is so beautiful! I was already excited to get her for a partner because she clearly has good taste. We even have similar color schemes, so I knew she would "get" what I like. Her hobby is also art, like me. Along with checking out each other's blogs, we Emailed back and forth several times over the course of the month to get to know each other better. I took a look at her TPT store and saw that she has some great clip art; I love her Happy Birthday freebie. Amazing! Most of these things I really would/have purchased for myself! Stacey, you did good! I love the lime green spots on the card. 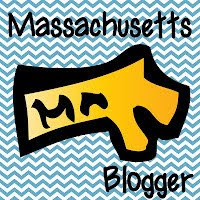 because it coordinates with my blog, which coordinates with my classroom colors. Those note cards are too special for note writing; I'm definitely saving them for a bulletin board next year. 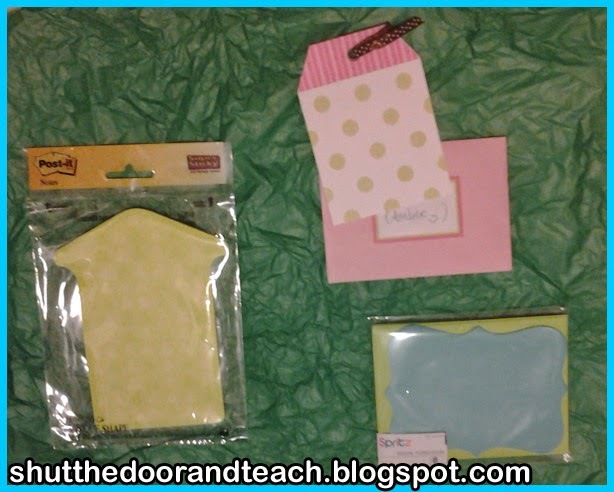 I've actually used lime green envelopes like those in the past for a bulletin board. Look at the handmade T for Thomas! Not only does it have the colors I love, but those are not haphazard polka dots, people. Look at the symmetry of it! The notebook will be put to good use (I am just about to use up the last pages of my current one for staff meetings). The Flair pens, well, I've only just recently become a convert from my old Pentel EnerGel pens. Last year I swore by those but this year since trying out the Flairs I've been using them a lot more often than the EnerGels. So again, this is something I buy for myself and use regularly! The drawing pad and high quality pencil were specially there because Stacey asked me what I like to use for my artwork and I told her "just pencil." I've bought that brand of sketchpad too, so again, this was perfect for me. It might be hard to tell, but the ink pad that goes with the T stamp is turquoise. Also perfect. And finally, the Lindt bar. Now, Stacey had asked me what my favorite chocolate was, and told her milk chocolate. But what I didn't tell her was that I used to work at Lindt chocolate, and it's my favorite brand! Good guess! 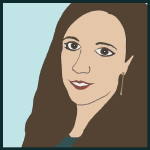 For my first SLANT box experience, you've set the bar awfully high, Stacey! If I never do another one it's because I want to quit while I'm ahead, haha. :) Seriously though, thank you so much for the time and thought you put into this. I hope you got one you love just as much from your partner. Readers, if you've never done the SLANT box exchange but you're interested, Jameson's blog is Lessons With Coffee. Just click on the "SLANT BOX" tab for the rules and information about it.